THANK YOU TO SASK MUSIC AND THE SASK ARTS BOARD FOR ALL THE SUPPORT THIS YEAR! Thanks to SaskMusic and the Government of Saskatchewan for supporting my fall Canadian tour! I made it across the country 3.5 times in support of Always With You. I had a great time in October with the Young Benjamins, and an even more amazing time in Ontario/Quebec on my own! The Cameron House in Toronto is one of the best music venues in Canada and I’m so happy to get the opportunity to play a residency there, and I can’t wait to get back there in 2014. I also want to thank the Saskatchewan Arts Board for their continued support of my music with an Independent Artist grant to allow me to take a break from the road this winter and get to work writing for a new album. I’m hoping to be able to get back in the studio sometime before next summer. I’ve been writing a lot in the last month and I’m really excited about the new material. I’m gonna be sneaking out to a few open stages over the holidays to try out some of the songs. 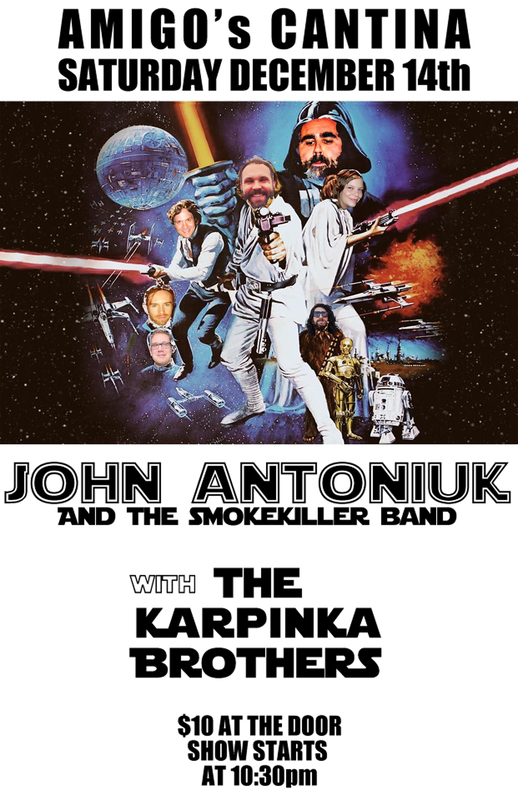 Come out to Amigo’s on Saturday December 14th for the 4th Annual Ukrainian Jedi Xmas show with the Smokekiller band (featuring Josh Palmer, Enver Hampton, Jen Lane, and Kyle Krysa) and starting off the night in true Jedi fashion will be Saskatoon’s own The Karpinka Brothers! Hope to see you over the holidays! I’m back! New Smokekiller EP! and “13” is ten years old! Canadian Music Week, Cameron House, and More!!! 2017 so far! Playing, producing, writing!